Sasha Duerr was a painter, but something in her oil paints was making her sick. She looked to the natural world and found a rich bounty of color that artificially produced paints couldn't begin to duplicate. In Living Color from Dark Rye on Vimeo. Sasha Duerr was a painter, but something in her oil paints was making her sick. She looked to the natural world and found a rich bounty of color that artificially produced paints couldn't begin to duplicate. Now, as the founder of the Permacouture Institute, she's turned her love of color into a thriving textile business where nature, art and food coalesce. She can't imagine coloring fabrics any other way. "Natural dyes harmonize with each other in a way that only botanical colors can," Duerr said in a 2012 interview. For example, a natural red dye will include hints of blue and yellow, whereas a chemically produced red dye contains only a single red pigment, making the color less complex. When you work with botanical sources, you are literally working with living color, which helps make the hues vibrate. In this video, which explodes with beautiful color, we see Duerr enjoy the rich pigment bounty of the San Francisco Bay Area, drawing equal inspiration from manicured gardens and from weed-strewn vacant lots. 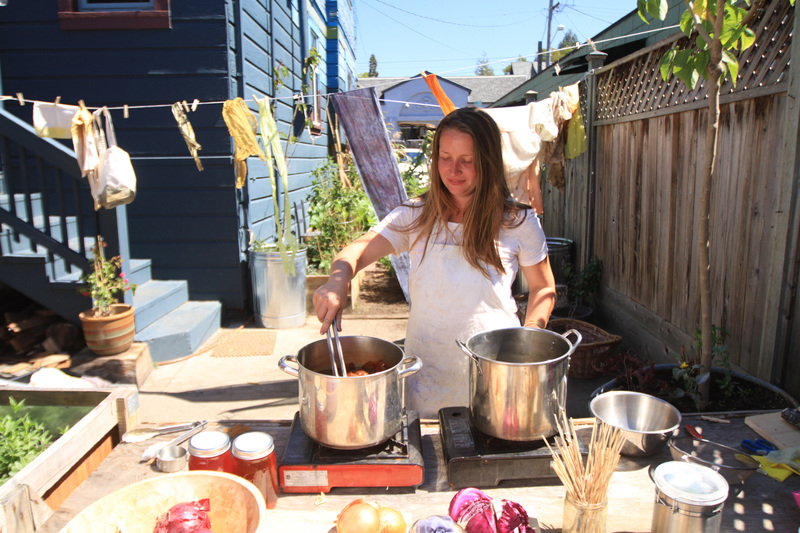 She creates her natural dyes based on what's seasonally available. In the summers, she harvests wild fennel for its bright yellows and dark greens. Blackberries yield a rich purple from the fruit and a bright yellow and grayish-green from the stems. "Both fennel and blackberries can be quite invasive in Northern California," she says, "so using these plants as color sources is a great way to tend the landscape." Clothes manufacturing and design is entering a phase similar to what food experienced in the 1970s. Spurred by the naturally available flora of Northern California, and led by the idiosyncratic political enthusiasms of the people who live there, there's a slow movement toward wearing and manufacturing sustainable clothes and linens. Duerr has taught a class at the California College of the Arts on how to color clothing without using industrial materials. Her nonprofit Permacouture Institute hopes to spread that gospel to public schools as well. "It's dire times, ecologically speaking, but it's also an exciting time for the creative potential that's approaching as we deal with all these issues," Duerr told the San Francisco Chronicle in 2008. "Limits build creativity. How do you as a culture, as a community, as a city start to think about better ways of producing for yourself? There are a lot of interesting solutions people are coming up with." It's no accident that now Duerr and the Permacouture Institute are throwing small dinner parties, aptly called "Dinners to Dye For," where naturally dyed linen and table decorations get equal billing with locally sourced, simply prepared fresh food, to the point where by-products and scraps from dinner are used to dye linens. Nothing gets wasted. For Duerr, it's all part of the same system. "Plant dyeing is much like the art of cooking," she says. Experimentation and patience can go a long way toward achieving successful and awe-inspiring results. With dyeing and cooking, you are relying on the same elements of alchemy, as both depend on preparing and working with plants. By creating your own botanical hues, you are truly engaging in the enjoyment of the process just as much as the product. This video from Dark Rye was produced by Caitlin Riley and edited by Jason De La Rosa.